TUCSON, Ariz. -- UCLA's luck finally ran out _ and how! Freshman Willie Tuitama, in his second college start, threw for two early touchdowns and Arizona rolled for 519 yards in a 52-14 rout of the previously unbeaten and seventh-ranked Bruins on Saturday night. 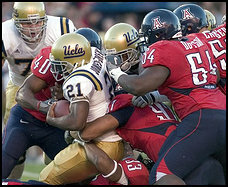 Arizona, losers of 19 of its last 21 Pac-10 home games, rushed for 320 yards. Mike Bell had 153 yards in 16 attempts, including an 8-yard touchdown run. Gilbert Harris added a career-best 116 yards in 16 attempts, one of them a 17-yarder for a score. Heath Slocum pulled clear of Swede Carl Pettersson and Loren Roberts to claim the Southern Farm Bureau Classic in Mississippi by two shots. 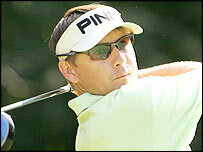 The trio were tied for the lead going into the 16th but Pettersson bogeyed the hole before Roberts did likewise at the 17th to leave Slocum clear.Slocum shot a flawless round of 66, including six birdies, to finish 21 under for the tournament.England's Brian Davis finished tied for 35th place on 12 under. TALLAHASSEE, Fla. -- North Carolina State seems right at home in Seminole country. Freshman Andre Brown ran for 179 yards and a touchdown and the Wolfpack intercepted three passes in a 20-15 upset of No. 9 Florida State on Saturday -- the second time in five years N.C. State has won in Tallahassee.N.C. State's Chuck Amato, who spent 18 seasons as an assistant to Florida State coach Bobby Bowden, is the only Atlantic Coast Conference coach to beat the Seminoles on their home field. Nedal Hussein admits WBO featherweight champion Scott Harrison will stand tall with the greats if he can stop him.The tough-talking Australian has questioned the ability and punching power of the Glaswegian ahead of their showdown at the Braehead Arena on Saturday night.But while Hussein has reiterated his vow to stand toe-to-toe with Harrison despite the champion's advice not to, he admits being stopped would convince him of the Scot's class. 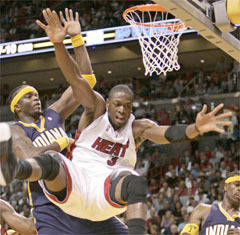 MIAMI (AP) - Jermaine O'Neal was celebrating. Shaquille O'Neal was on crutches. A look at either O'Neal told the story Thursday night. Indiana's O'Neal scored 27 points, six in the final three minutes to help the Pacers recover from wasting a 14-point second-half lead and beat the Miami Heat 105-102. "There were a lot of times we could have broken down," said Ron Artest, who added 22 points for the Pacers who have won 13 of their last 14 regular-season meetings with the Heat. "But we didn't. We stayed together throughout this whole game."